It’s not often you get a chance to create a TVC from concept through post production so when Reinhold & Jamie-Lee Habeler from Concept Creative Communications suggested The Film Bakery collaborate on a charity TVC for Westpac Rescue Helicopters, Ben and I jumped at the opportunity. Reinhold sent through a link to a 2002 Surf Lifesaving TVC as a reference for the type of TVC he had pitched the client on. Beautifully framed and shot, the 2002 reference TVC was inspirational and emotional and you got a glimpse of Australian beach culture. I was particularly drawn to the emotion of the TVC and decided that the TVC I wanted to create for the Westpac Rescue Helicopters had to have a strong emotional core. I remembered a classic TVC from the 1980s OTC “Memories”. I connected to the OTC “Memories” TVC because I could relate as most of my family live overseas. As a Writer as well as a Director, I’ve discovered the stories that people connect with the most are the ones that are personal – something I’ve either experienced first hand, or seen second hand through friends or family. My mother has been in and out of hospital five times since last July. We almost lost her the first time, and the night before she was discharged for the fifth time, we got the call that her mother, my grandmother, had died. It’s been an emotional rollercoaster for four generations of family trying to support her while she copes with the emotional and physical challenges of her recovery so I didn’t have to think very hard about how to write from an emotional place. Researching the history of Westpac Rescue Helicopters, the fact that surprised me most was that no-one has ever paid to be rescued by them . 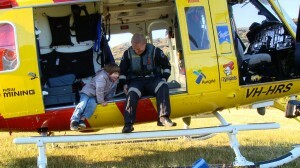 From the history of rescues on the Westpac Rescue Helicopters website, I found the most emotional stories were the ones that were about a child – probably because I was a mother, so I decided to write a story from the mother’s perspective. I decided to use flashbacks as a means of both doing a back story and a parallel story. I wanted to hint at what happened without being explicit. It was also important that I didn’t show the child actually hurt. One, because I didn’t want to see that shot as it would be too confronting, but two, I felt it was more powerful to know that something had happened to the child because he needed rescuing, but allowing the viewer to fill in the blanks would help make it more personal for them. I was looking for someone who was warm and earthy that could genuinely channel the emotion of the young mum. The viewer needed to feel for her, feel with her, worry for her… for the TVC to work. Also, because I was really visualising a lot of the shots of the mother from behind, alone on the beach, wide, so she had to be a strong actor so that the viewer could still feel her emotion even without seeing her face. We cast Gemma Dawson because her innate warmth and beauty was simultaneously feminine, strong…and fragile. Her background as a dancer also meant she was in tune with her whole body, making the shots of the mother from behind just as powerful as seeing her face. We were very fortunate that the little boy, Harrison, could pass as her son – they shared beautiful blue eyes, fair hair and good health. Harrison’s exuberant and cheeky adventurous spirit also played well with Gemma’s playfulness in the flashback scenes. Preproduction was a lot more time constrained that I would have liked – I had compiled a ton of visual references for the isolated beach look I was after, but a combination of some extended projects, an emergency trip to Tokyo for my grandmother’s funeral and fixed shoot dates meant I didn’t have time to complete my normal schedule of preproduction. I decided creating an animatic was the most time-efficient means of conveying to cast/crew the story/tone/look/overall shot list of what I wanted to shoot. Using the iPhone to record a temp VO track to record the script, I cut together some of the visual references I had been researching together with atmos and music. 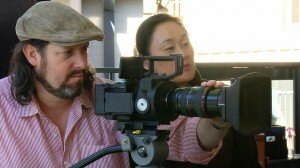 We were given access to use the Sony NEX-FS700 from Sony for the shoot. We decided to use our Canon lenses – between the 10-22mm wide angle, the 24-105 L-series zoom and the 50mm, we were confident of being able to frame accurately. The FS700 had three options of slowmo – 50fps, 100fps and 200fps. I’m usually more fond of 60fps and 150fps because I like the rhythm these speeds allow me to cut, so this was going to be an interesting challenge getting used to a different rhythm which was surprisingly unsettling as it would force me to be more freeform when it got to editing the TVC. We decided to use 50fps for all the chopper footage as we needed to see action and with a one minute TVC there wouldn’t be time for long shots, but I decided to shoot 200fps for the widest physical shots and 100fps on CU’s and where I chose to reframe a shot for coverage. I was originally intending to shoot at Dudley Beach, South of Newcastle, NSW but was advised given the close proximity to residential areas, having the chopper circling at dawn would not go down well. I really liked the different textured terrains around Dudley Beach – there was beach, rock pools, sand, different water etc…and had cut the story of the animatic making use of these terrains. 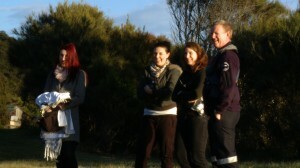 The chief-pilot Mike DeWinton suggested the next beach North, Glenrock Lagoon could be an alternative possibility. I didn’t have time to recce – which was nerve wracking – so Ben shot tests and took loads of pictures of Glenrock Lagoon and talked me through the location in detail. The lagoon was stunning and meant that the chopper could also land on location but the lagoon didn’t have the same number of different textured terrains, so I ended up reworking the animatic and shot list. Ironically, even though we planned a Weather Hold, it was one of those rare occasions where bad weather would still have worked. Ben’s discussions with Mike also brought about a wonderful opportunity. We were told that a crew member would be in full gear on the day if we wanted to shoot him. With our fair, blue-eyed talent and the beach location, I really wanted to keep the colour palette monochromatic – just the blue of the water, the yellow of the sand against whites/blacks/greys. 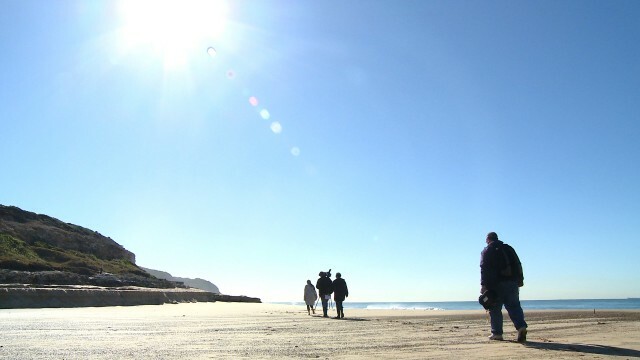 The other key element to the look of the TVC is I wanted real wide shots of the beach to help convey the mother’s isolation – she’s all alone on the this big expanse of beach and somewhere on this lagoon is her child who needs help – and close-ups for the flashbacks, but making sure I had enough coverage of the key emotional moments of the mum on the beach to be able to cut in and out of it as needed. I balanced out the wintry beach wardrobe with a more summery wardrobe for the flashbacks. I liked the movement and flow of a long grey cardigan for the running shots, and the idea of an all grey figure on the beach. I was prepared for wild weather on the beach, so wanted to make sure Gemma’s hair was up and back from her face and kept makeup very neutral and natural. For the flashbacks, I wanted a softer, girly look – some curls to the hair, more colour in the makeup, but still maintaining a natural look. For Harrison (the boy), I wanted his flashback and beach scenes to feel more mirrored so kept him in greys and faded jeans. I didn’t have a detailed shot list – rather an overall ‘package’ of shots I knew would make the story work, with alterntive/additional shots that I would shoot as I could for detail. Again, this is usually the style of shooting I use for documentaries as it allows me a template to stick to a visual style and framing, but again, because of the shorter preproduction period, I found this type of shot list to be more comfortable. I captured stills of the shots in the animatic, then used additional perspective shots of how else I wanted to try and capture the emotion within that section of the TVC. I also re-worked the animatic to accomodate our new location and tweaked story. Referring to these visuals on set made me constantly aware of the style of TVC without making me a slave to exact shots – again a luxury of having creative freedom. Given we were shooting video and had ample storage on the cards, Ben and I decided that he would button on before and after I called action at times – especially with respect to the chopper – as while Ben has had extensive experience shooting with choppers, this was my first helicopter shoot and I didn’t know exactly what shots I would be able to get, but I knew the feel and tone of what I was hoping to capture. It’s infinitely fascinating that while on some shoots you can pretty much shoot your storyboard, on most shoots, you really just have to go with the flow. The only thing you can control is how much you research, prep and how well you can stay focused on the story. Surprise number one came in the form of what I could shoot with Mike #2, the crew member. 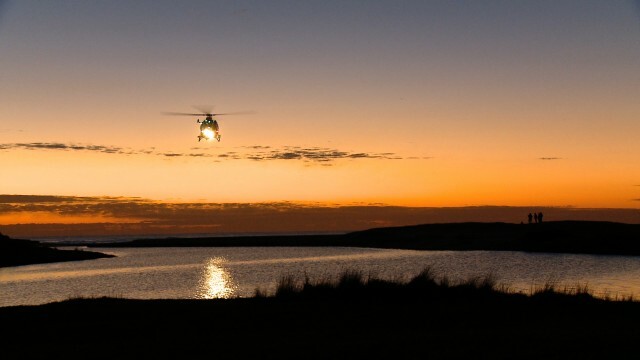 I had reworked the story so we could bring in the helicopter earlier so we could show glimpses of the crew member searching for the boy, then the main hero shot of the crew member lifting the boy to safety of the chopper….but on the day discovered that the shot I was planning wasn’t workable. Luckily, we were able to compromise and frame a shot that was tight enough to not see that the helicopter blades weren’t rotating, but wide enough so we could see that it was the chopper that the little boy was being lifted into. Realistically, we were told that a stretcher would be used, but I decided to err on the side of emotional pull as I really wanted that shot of the boy in the crew member’s arms. Also, it was going to be easier for Harrison to be cuddled rather than be on a stretcher – which was the major factor in making this ‘unrealistic’ decision. Surprises number two and three came about because Ben buttoned on before and after the helicopter approach/departures. One, we were able to get what we’ve termed the “Top Gun” shot of the crew member walking in front of the chopper. (Sadly this would end up being an unintentional homage to Director Tony Scott). Two, crew member Mike gave us one last dramatic shot as a bonus heading straight down the barrel after we’d got the departure in the can. Both were such phenomenal shots – but completely unplanned – but too good not to use so it was my responsibility to figure out how to rework the story to make these shots fit. Surprise number four is that I ran out of time to prep Gemma when it came to her big wide shot where she sees the chopper. We were told we only had up to an hour with the chopper so I was focused on getting these shots out of the way so we could concentrate on her parts of the story, but I forgot that while we were up inside the chopper I wouldn’t be able to talk to her. Gemma had seen the animatic and Reinhold had told her not to move, but I didn’t have a chance to chat in detail about the shot, so when Gemma saw us heading towards her, she bolted! Funnily enough, I thought she was so in the moment and went on actorly instinct by running after the helicopter who was there to save her son, but Ben and pilot Mike realised that she was actually running for her life! Luckily, after viewing the footage back after we landed, we realised it could be interpreted either way, but we’d need shots on the ground to explain what happened. Surprises number five & six were wardrobe-related. The grey got lost in translation and we ended up with black leggings and because I was getting Gemma to do so much running, she’d have to lose the shoes (which we’d already shot in the EWS from the helicopter and didn’t have another shot at…but we were so far away, unless you were really looking, wouldn’t see she’s wearing shoes). Ironically, the black leggings and seeing bare feet on sand ended up working so much better that I wish I could take credit for it. I decided to rework the story’s time of day so we could work in the surprise helicopter shots – by starting in the middle of the day, we ended in sunset, although Ben did point out to me that meant the sun was technically setting in the east! Fortunately, the flashback sequences went very smoothly. Because we’re shooting with a three-year old, you kind of have to just see what they do naturally and wing it – which let to a couple of unexpected bonuses – Harrison peeking out from the trees, and a WS flashback of Gemma & Harrison together on the stairs. During the shoot I also had a chance to learn more about some of the Westpac Rescue Helicopter missions from Justine Orton and was amazed that sometimes the crew would go out on more than one mission a day. When you put it in perspective and realise that while some rescues, like our fictional TVC scenario had happy endings, a lot of them don’t, so to think the crew can do this sometimes up to five times in one day is a very sobering thought. Justine also mentioned that many of their pilots end up staying with them 25 years and longer – there would be few pilots who would fly as much as they do, so these are pilots at their top of their craft, many married with kids themselves, dealing with life and death every day. You never think something like this will ever happen to you – but there’s an overwhelming sense of relief knowing that there are people like the two Mikes out there. The edit took a day (8 hours) and was mostly mapping out the beach journey vs the flashback journey. Because the voiceover, sounds design and atmos/music were such a big part of the edit, I decided to start with this stage first and created a one minute bed that I tweaked as I laid in pictures. I was initially toying with the idea of using subtle ‘Star Trek’ like lens flares at the start of each of the flashback shots, but as the cut came together, the simplicity of cutting in and out felt more natural, real. The grade and sound mix were a little more complex. Sound design took about 5 hours, and we ended up spending 12 hours grading and 9 hours mixing but we had the luxury of spreading this out over several days as we were experimenting with a variety of looks and wanted to come back fresh. Because of the short preproduction period, I had a look in mind for grading the beach shots, but I was more freeform with the flashbacks – I tried to shoot generic backgrounds so that these would be easier to grade, but as it cut together, the shots I preferred ended up being a mix of light, dark and textured backgrounds so matching these as a group of flashback sequences were more challenging than I expected. We ended up with six different looks and there was something in each that I liked, but it wasn’t quite right. I had thought making the flashbacks look completely different will help tell the story but having the grades contrast looked too full on. In the end it was trying to make it whiter/lighter with shadows and blues is what felt right – and helped balance out the beach shots without taking you out of the story. We went all out in the sound mix as we wanted to make the TVC cinematic and expansive. Ben ended up having over 50 separate tracks of audio as we balanced out the beach sequences with beach atmos, seagulls (even though you never saw any), crashing waves, helicopters…and flashback sequences with reverb, neighbourhood atmos such as dogs (even though, again, you don’t see any! ), giggling, and atmos cues – all amidst voiceovers and music! Jamie-Lee found a vibraphone sound effect we had in the flashback sequence distracting, so we re-worked at atmospheric riff to fit in its place. We were also planning on using logo or text either at the end of the TVC or over the last helicopter shot, but the logo (which features a helicopter) over a helicopter or just after a helicopter didn’t work, and having text (Westpac Rescue Helicopters. Community funded since 1975) on the shot was distracting, so we decided to leave it simple. It was important to leave the viewer with space at the end of the TVC to have the chance to absorb the story. You don’t know what happens to the boy, but you know because he has been rescued, he will be safe. And I found the fact that no one ever pays for the chopper to come out and that they are fully community funded to be such powerful statements, that I wanted to make sure these were incorporated into the script. Hopefully, if the TVC connects with the viewer, they will help donate.